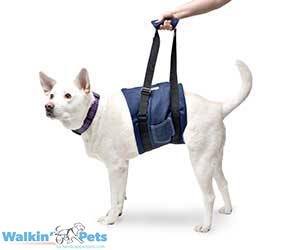 The Walkin' Support Sling is designed to support your pet with ease and protect your back from unnecessary strain. Never suspend a dog in the air from the Walkin' Support Sling. If you have to fully carry a dog that cannot support any weight on its legs, pick him up and cradle him or use a pet transport stretcher. X-Small 13" - 16" 13" - 16" 4"
Small 18" - 22" 18" - 22" 6"
Medium 22" - 26" 22" - 26" 8"
Medium/Large 24" - 28" 24" - 28" 10"
Large 29" - 35" 29" - 35" 11"
X-Large 36" - 44" 36" - 44" 12"